This event it open to all. Teachers and parents at PS 24 in Sunset Park will be holding an informational session on charter schools using clips from "The Inconvenient Truth Behind Waiting for Superman" and other materials. I'm expecting to tape the event and put it up online. If other schools want to hold an event similar to this email me and I'll put you in touch with the organizers. Of course the UFT should be doing this all over the city but they don't want to step on too many toes. Why should your school do this? If you don't see the handwriting on the wall where one day masses of schools will be replaced with non-union charters it is time to wake up. FEB. 4- STATE OF THE UNION: TIME TO FIGHT BACK Register at: http://stateoftheunionconference-estw.eventbrite.com/ See Norms Notes for a variety of articles of interest: http://normsnotes2.blogspot.com/. And make sure to check out the side panel on the right for important bits. Shuffling high-needs students from school to school has not addressed fundamental educational issues. Under Mayor 13% the schools in the city with the fewest Black, Latino and low-income populations prepare students for college at more than four times the rate of our schools with the largest number of Black, Latino, and low-income students. Under Mayor 13% his plan is to close about 80 schools, on top of 117 schools already closed. Students from closing schools, CUNY students, public school parents and community members will rally in Union Square on Wednesday to protest Mayor Bloomberg’s closing schools policy and failed “reforms”, and demand he change course to fix an education system in crisis before he leaves office. Poll after poll shows that New Yorkers disagree with Mayor Bloomberg’s education policies and don’t believe he’s achieved real results as mayor, yet his administration continues to double-down on failed “reforms” such as the mass closings of schools that move high-needs students around rather than meet their educational needs. In fact, more than 50 schools are now on the block for closure, and 25 of them will be voted on in February alone. The rally will be followed by a hearing at Legacy High School near Union Square, where a community of parents, educators and students have been fighting to keep their school open. Much like other schools on the closing list, Legacy has very high rates of high-needs students, yet has been threatened with closure instead of offered help. The rally and hearing follow a press conference today where four major candidates for mayor– including the City’s Public Advocate, Manhattan Borough President, and the current former Comptroller – blasted the mayor’s school closings policy, and questioned whether high-needs students were being “lost” when schools are closed. These students – self-contained special education, over-age and other historically lower-performing students – make up a smaller percentage of student populations at many of the new schools founded by the administration. Other student populations – particularly low-income students of color – have also not fared well under the Bloomberg Administration. In fact, parents and students have labeled Mayor Bloomberg as “Mayor 13%” for his administration’s failure to prepare 87 percent of black and Latino students for college. Just one-in-four students overall are prepared for college under Bloomberg, and just 39 percent of public high school graduates last year reported they would be attending four-year colleges the following fall. WHO: Parents, teachers and students angry with DOE from schools set to be closed, chanting and holding signs. Schools attending include Legacy, Lehman, Gompers, Gateway, Washington Irving. They will be joined by CUNY students, including Students United for a Free CUNY, New York Students Rising (NYSR), and students from John Jay, Hunter, BMCC, Brooklyn College and Brooklyn Tech. At the State of the Union conf this Sat. Jeff and James Eterno will be doing a Know Your Rights workshop which will include issues related to principal abuse, incompetent or uncaring union officials (why so many come to Jeff and James), your rights as an activist/organizer, and other issues raised in a Q and A. Their workshop is scheduled for after lunch. Please note as a UFT representative you have exceeded your boundaries by asking me to allow Ms. __________, to leave early because she was not feeling well. Your words to me were, "she was afraid to come to me herself because I would not believe her." Just a reminder, I was not in contract violation because of her feelings and therefore you may not ever come to me in that manner again. Please note your job as union representative is to come to me when I violate the contract, not when members are trying to avoid doing their job. First of all the member came to me because she was not feeling well and wanted to go home. I told her to go tell the principal. She said she didn't want to as the last time she asked the principal was very loud, yelling in the office in front of teacher and parents. The last time the principal did not let her go (I told her she could have filed a grievance, that she has a right to go home sick...which she decided not to). I told the principal that the member was not feeling well and didn't want to ask her herself because last time she had talked very loud in front of parents and staff. I told the principal that I had told her that she needed to ask the principal herself. The principal said to tell her to come talk to her. I did and evidently the principal told her she could go home. Then I get this letter to file. What can I do in response? Can she put a letter in my file because I told the principal that a member is not feeling well? Absolutely. File the grievance. It is absurd that you can only go to the principal on contract violations. The fact that your principal would write a letter is a clear indication of her union animus and should be responded to by grievance and otherwise. The grievance should make it clear that the contract gives the Chapter Leader a much larger role in the school than merely guard dog. The nature of the relationship is envisioned (through consultation and the like) to be cooperative and mutual benefit. I don’t know how your DR will treat this but I would try to get a petition from all of your Chapter instructing the principal how she should treat you with words to the effect that without open channels of communication your school will suffer. Depending on how far this has to go I would send the petition to the superintendent as well if the letter wasn’t removed. The upside of the incident is that you can use it as a way to get your members less complacent and the letter, from what you quoted, doesn’t really seem disciplinary against you. I love the smell of a good charter school scandal early in the morning. Anna Phillips has a piece at Schoolbook today that is worth checking out. We know that money can also disappear in public schools. But there are more oversights. Charters where public money is placed in private often lightly regulated hands are subject to all kinds of abuses. This one is interesting for the ties that bind. On the board is the wife of Spencer Robinson, the billionaire's son who started PAVE in red Hook at PS 15, the only good that came out of this is the activation of the amazing PS 15 crew which includes Julie Cavanagh). 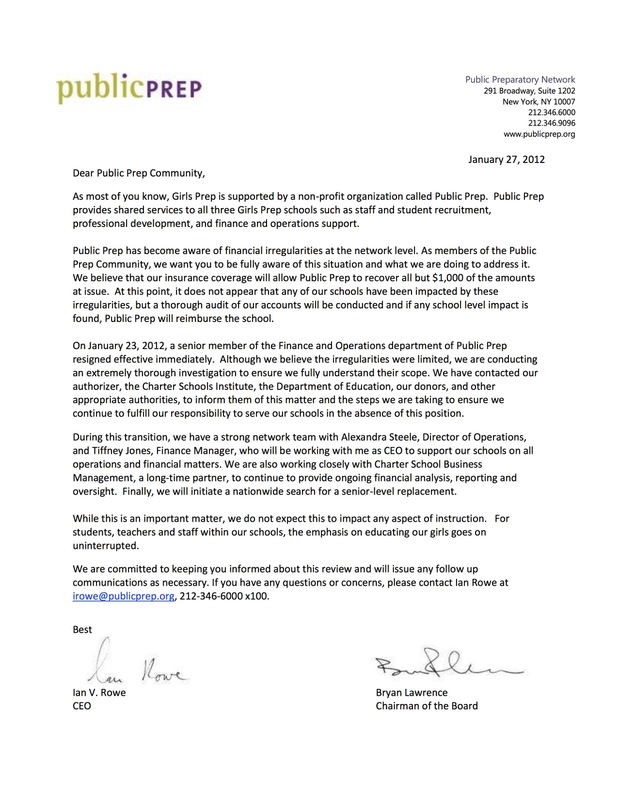 Lots of hedge hogs support Girls Prep --- nice management by the Board of Directors. Note that the alleged scam artist, Christina Garcia-Coleman, the network’s managing director of finance and operations, is also a trustee at the Spence school where Bloomberg's daughters went. Jan. 30, 2012, 3:12 p.m.
A New York City charter school network has told parents that it is a victim of theft by “a senior member of the finance and operations department,” who it says used the network’s credit card to spend tens of thousands of dollars on personal items. In a letter sent Friday to parents of students in the three Public Prep charter schools, Ian V. Rowe, the network’s chief executive, and Bryan Lawrence, the board chairman, wrote that they had discovered “financial irregularities,” but that all but $1,000 of the money would be recovered through insurance. Public Prep operates three all-girls charter schools in the city, two in Manhattan and an elementary school in the Bronx. Mr. Rowe said the network’s staff detected problems in early January. He would not specify how much money was missing. He said the network was asking the district attorney’s office to investigate Christina Garcia-Coleman, the network’s managing director of finance and operations. Ms. Garcia-Coleman resigned on Jan. 23. According to her biography on the organization’s Web site, she was also a board member of the network’s Bronx elementary school, Girls Preparatory Charter School of the Bronx, and resigned from that as well. The Web site of the Spence School, a private all-girls school in Manhattan, also lists her as a trustee. E-mail and phone messages left for Ms. Garcia-Coleman were not returned. Gotham Schools actually linked to what could have been a paid ad but if Evan or Sydney should barf there will be a link. I left a bunch of comments on Gotham. Julie's great comment on the nycednews listserve is worth adding. I'm away from a computer but want to share. Julie hopes the UFT leadership won't fold. I don't have as much hope. She's young and hasn't faced 45 years of folding. ATR Philip Nobile follows with a comment posted at Gotham on the DA where Mulgrew waxed poetic about Merryl Tisch --- since then she has put a knife in the back of the UFT. "The biggest sticking point in negotiations was the UFT's insistence on an unnecessarily arduous appeals process." An appeals process that is fair, transparent, and independent is absolutely necessary. Without it, educators will be beholden to serving administration first rather than children and families. Google Peter Lamphere to understand how important this is. He recently won the first of two lawsuits to overturn politically-charged and completely unwarranted U ratings. He is one of the finest teachers and people I know, and his career was almost ended because of a rouge principal. What was the DOE's response when he won this lawsuit? They were "disappointed" bc the DOE believes that independent fact finding and a judge, who both cleared Peter, are irrelevant compared to the "judgment" of the principal. There are countless Peter Lampheres out there, who, because they advocated for their students, families, and/or colleague(s) they were given U ratings, with some eventually terminated or discontinued. Before Evan and Sydney decide to buy their next editorial, perhaps they should go back and actually teach, understand the ramifications of what they are talking about, and ask themselves this important question: is the role of teacher evaluations to subordinate teachers or is it make sure we have the best teachers we possibly can working with our children. Obviously, it is the latter. An appeals process is a key part of teacher evaluations, without it, teachers cannot stand up to unfair, immoral or illegal practices that negatively affect the people they serve. Those who know me know, I can be critical of the UFT (leadership). In this case, I applaud them tremendously for taking a stand on this and I hope they do not fold in this new round of negotiations. Teacher protections protect children, our interests are aligned. The overwhelming majority of teachers are working tremendously hard for our kids. For those that need support, we can make them better. For those that should choose another career (and let's remember in reality this is a very, very small number of folks, not the majority as the rhetoric out there makes it seem), we can fire them. What we cannot do is sacrifice a protection for a teacher to act in the best interest of a child or colleague over the objections or threats of a politically motivated principal or Department of Education. I was at the DA in 2009 when Mulgrew explained his sellout on the 20%. The UFT had always been opposed to linking test scores with teacher ratings. Leo Casey took a very hardline. I remember a seminar at 52 Broadway during which he tied a tin can on the idea. Nevertheless, without consulting the rank-in-file on this momentous labor policy shift, Mulgrew signed a “peace in our time” pact with SED. He told the DA that the 20% solution was necessary to secure Race to Top money and that things could have been worse. He took a bow for resisting SED’s preference for a floor of 40% , now resurrected by Cuomo and King. You don’t have to be Tom Paine to wish that Mulgrew had taken a stand before the slope got slippery. Video: Why Attend the State of the Union? The UFT leadership under Michael Mulgrew supports mayoral control, charter schools and a deal on evaluating teachers based on faulty value-added test scores. And recently, Unity Caucus pushed through a constitutional amendment that will result in an even further reduction of the voice of the classroom teacher in the union. The public school where I've been teaching for the last 8 years has been targeted for a "colocation" with a corporate-model charter school. Most people, including me, don't know what a colocation looks like, though we've heard bleak stories. I've started this blog to document it as best I can. This ad is in the subway stop near the school. This is my first time seeing an elementary school with a million dollar ad budget. Ads have been plastered on doorknobs, in stores, and in mailboxes all over the neighborhood. Well, not quite. The ads have appeared all over the affluent/white areas of the neighborhood, but are noticeably absent from the blocks inhabited by neighbors of color. On Wednesday, January 25, the school received a shipment of these high-quality moving boxes, assumedly compliments of Eva Moskowitz. They were loudly rolled through our hallways during state testing. Guess it’s almost time to start packing up our classroom libraries and student portfolios. I have lots of interesting material on the failure of UFT policy – so much that I can't put it all in one post – so I'll do a series. When you finish reading it all throughout the upcoming week, you are going to rush over to the State of the Union registration page and sign up for next Saturday's conference (there's a $10 fee because the rental is a grand) or if you don't register, next Saturday you will wake up and rush over to catch the action. Today I'm focusing on what many of us consider a failure of UFT leadership in responding to the attacks on teachers for political reasons and Tweed's continued support for principals who do so. That commercial running that attacks Bloomberg's failures? I can live with that but it doesn't do anything to make OUR case for resisting ed evals without some protection, including a call for an independent investigation of abusive principals (I presented such a resolution at a DA in 1999 or 2000 and Unity killed it). Mulgrew response on the ed eval where he has openly said how much he supports Cuomo (and in the past how much he loves working with the lying, double-dealing Regent head Merryl Tisch). Lame Mulgrew letter to parents. How hard is it to explain that without an appeals process as part of teacher evaluation, teachers will have to put administrators first rather than the children and parents they serve? Not only the truth, but much more palatable narrative/ case to make to the larger community, especially parents. Instead the focus is on bashing Bloomberg (that kind of attack politic is never favorable in the eyes of the public) and "helping" teachers, which while true that is part of what an evaluation system must be/should be, not the strongest part of the argument in terms of mass public in an ad. In the ad, Mulgrew also reiterates his call for third-party negotiation to hammer out the final details of a new evaluation system for at least some city schools. Both Chancellor Dennis Walcott and Mayor Michael Bloomberg have dismissed the call for arbitration, saying that the sticking point — whether an independent party would hear the appeals of teachers who get low ratings, as the union wants — is not open to discussion. But when push comes to shove Mulgrew won't trot out Peter Lamphere--- and I should point out that Gotham has given Peter a lot of space to tell his story while the NY Teacher has not. (See links below but search Gotham for Peter's name for more). I also used my time at the Dec. PEP meeting to call Walcott out on the Peter Lamphere case and will continue to do so at every opportunity to make the point that Walcott is not really interested in quality teachers when he supports principals who U rate them for political activity. Isn't it time for the UFT to gather Peter and others and call a press conference? Isn't it time for the UFT , which got NYSUT to fund his suit on one U rating to do the same on the other? After all, he was only doing his job as chapter leader. The UFT's failure to do so sends a chill down every CL's back. Peter Lamphere | GothamSchools - do a search for articles -- see list below. I never shy away from comparing people to Nazis so I don't get upset when ed deformers do it to us. This reminds me of Alexander Russo saying real reformers are Goliath and poor Bill Gates, Eli Broad, the Walton Foundation, Rupert Murdoch, et al. are David. This was written by educator Anthony Cody, who worked for 24 years in the Oakland schools, 18 years teaching science at a high-needs school and six years as a mentor and coach of teachers. He is a National Board-certified teacher. You can follow him on Twitter at @anthonycody. A version of this post appeared on his Education Week Teacher blog, Living in Dialogue . As state after state rewrites their education laws in line with the mandates from Race to the Top and the No Child Left Behind state waiver process, the teaching profession is being redefined. Teachers will now pay the price: They will be declared successes or failures, depending on the rise or fall of their students’ test scores. Under NCLB, it was schools that were declared failures. In states being granted waivers from the most onerous requirements of NCLB, it is teachers who will be subjected to this ignominy. Of course we will still be required to label the bottom 5% of our schools as failures, but if the Department of Education has its way, soon every single teacher in the profession will be at risk for the label. This revelation came to me as I read the 17th edition of the Score Card on Education prepared by the American Legislative Exchange Council (ALEC), authored by Matthew Ladner and Dan Lips. This is a remarkable document. It explains where each state stands on the education “reform” initiatives that have become the hallmark of corporate philanthropies, the Obama administration and governors across the nation. “ ‘Now this is not the end. It is not even the beginning of the end. But it is, perhaps, the end of the beginning. Henceforth Hitler’s Nazis will meet equally well armed and perhaps better armed troops. Hence forth they will have to face in many theatres of war that superiority in the air which they have so often used without mercy against others, of which they boasted all round the world, and which they intended to use as an instrument for convincing all other peoples that all resistance to them was hopeless. In 2011, America’s struggle for education reform may have also reached a turning point — an end of the beginning. In case you missed it, in this analogy, the teacher unions represent the Nazis, while the forces for corporate reform represent the doughty British and their allies. How sad that so many principals in NY State are standing up on the teacher evaluation mess while the UFT tries to make a deal. Here are a few quick hits. In this program we speak with Sean Feeney, principal from Long Island New York, about the stance he and other principals have taken against the imposition of value added measures in the new Annual Professional Performance Review in New York State. We also speak with Celia Oyler, professor of education at Teachers College Columbia University, and Karen Lewis, president of the Chicago Teachers Union, about the impact of value added measures on teacher education and the corporate powers behind these measures. Let's say you're taking a bubble test and you have only an unsharpened pencil. Clearly you have a problem. Right? B) Replace it with another unsharpened pencil? On Wed. night at the CEC 2 meeting, I will be presenting our analysis showing how NYC’s progress in student achievement since 2003 is the second smallest among 10 cities, as measured on the national assessments called the NAEPs. NYC is also the only city tested in which non-poor students have lower average scores now than in 2003, when the mayor’s policies were first implemented. Please join us! Please also check out the eloquent account of a teacher who recently quit the profession because of the DC evaluation system, similar to what the Mayor is proposing here. Community Outrage: What is Eva Moskowitz's husband Eric Grannis up to in Brooklyn? There is so much going on around the Eva Moskowitz Success Charter invasion of Williamsburg (and Cobble Hill) that I could do 5 blogs a day. 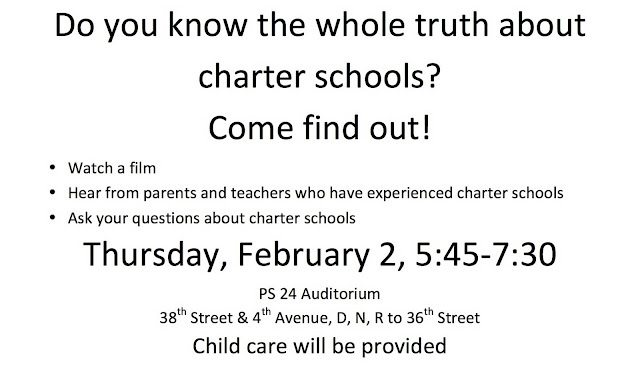 Last night around 40 people came out in the rain to PS 84 where CEC 14 sponsored a screening of our film. I have to write a number of posts on the situation in Williamsburg/Greenpoint where I spend my entire almost 40 year career (see below this post for some links of previous posts). 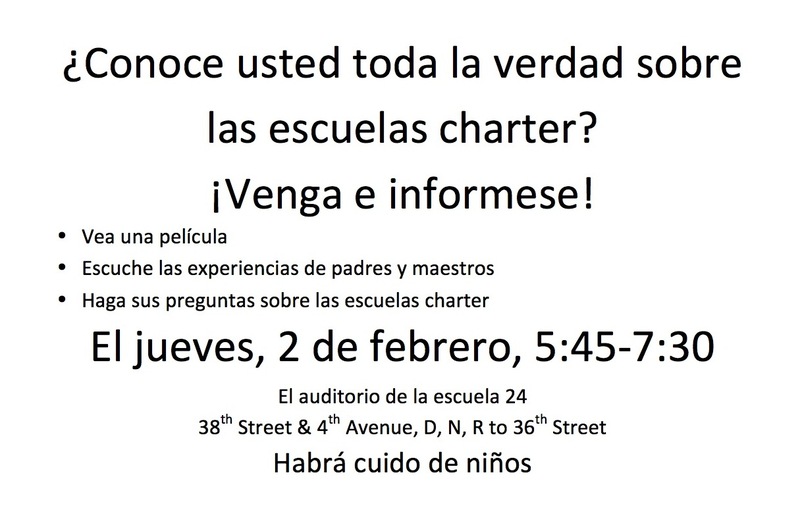 What is going on here is that Eva is getting an elementary school (PEP votes March 1) into MS 50 which is 2 blocks away from PS 84 while hubbie Eric aims a new charter chain at that school (where I spent the last part of my career), even degrading it to his toney target audience. This info below was compiled by an amazing parent activist defending public education who I just met last Sunday at one of our screenings. Grannis' umbrella group, the Tapestry Project, employs one person: Etoy Ridgnal, of Stand for Children union busting AstroTurf fame. And with Etoy's help, Grannis is already brokering his first deal to charter-ize north Brooklyn. His Letter of Intent to open two schools in Williamsburg via the aggressively expanding wannabe chain Citizens of the World was filed with SUNY January 19. The first CWCS was founded a year ago in Los Angeles, by former Teach for America Los Angeles board chairman Mark Gordon, who quickly opened two more in LA. The two Williamsburg schools will be the first in New York, and plans include scaling up to almost 1,000 students in co-located public schools. http://www.cwcschools.org/newyork.html CWSC board minutes include plans for partnership with a national chain, but which one is not clear yet. "I'm not a local parent (although Williamsburg is such a wonderful neighborhood that I confess it is tempting!). I have to admit therefore that I'm interested in helping improve education in an area I which I don't live. Just as someone might volunteer in a hospital or volunteer in a school that is not in their neighborhood, I'm helping out in a neighborhood that isn't mine (or at least I'm trying to). I think that it's possible to have some insight in to the needs of neighborhood one doesn't live in because all kids need to learn to read, write etc…. I don't think that what would be a great school on, say, the Upper West Side or in Park Slope is entirely different than what would make a great school in Williamsburg. But this really isn't about me. My goal, as stated in my email, is to bring people together to collaborate on creating charter schools if they want to. I want those charter schools to be designed by Williamsburg residents in collaboration with educators. I don't intend to sit on the boards of these schools, I don't intend to be employed by these schools etc…. I intend to help to help parents.I don't doubt that there are good schools, good principals, and good teachers in Williamsburg and I'm happy to hear that you are happy with yours. If everyone is as satisfied as you are and doesn't want to start charter schools, then I'll pack up my bags. From speaking with parents, however, there do seem to be some parents who are not satisfied with their options and want other ones. For those parents, I am making my time and the time of others available for whatever assistance I can provide." And here is the GEM video of the Jan. 17 hearing at MS 50. Report from the island: UFT leaders did their job. Some people think PS 14 SI was chosen because of criticism of Tweed for leaving SI schools off closing lists for political reasons since SI politicians support Tweed and the SI PEP rep always votes with them. Maybe they are worried about future lawsuits on school closings charging them with racial discrimination. Who knows what lurks in the minds of Tweedies? Other than how to parlay their position so they can get a job with the ed deform movement when they leave Tweed. Here is a statement from Loretta Prisco from the Independent Community of Educators (ICE). The Advance asked if the children in the doomed PS 14, already deemed a failure, are going to be relegated to a lower tier in DOE’s eyes? No crystal ball is needed. PS 14, the students and staff will follow the same path as other phase out schools - not a rosy one. The good intentions of the Superintendent, staff, parents and CEC will not keep it from traveling this inevitable path, worn down from so many phasing out schools. Parents will get a letter stating that the school is being “phased out" - which should be more aptly labeled, “going through a slow and painful death” – and they will given the opportunity to transfer out. The children of the parents who can negotiate the system, usually test higher, and will transfer out. The children left behind will be the lower achieving, traditionally have poorer attendance, and have parents who are the least connected to school, though not necessarily the least caring. As the population diminishes, so will the resources. Those with low scores who transfer will be seen as piranhas as they take their low scores with them to the receiving schools that will be held accountable for them. To the DOE, these children are - “throw aways”. The teachers will know that their days are numbered, and those who can, will understandably leave to secure jobs and avoid the death sentence of becoming an ATR. The remaining staff will be completely demoralized and lack the resources needed to teach. The principal, whether the current or newly appointed, will know this is a short time assignment. The new school will get lots of extra money-classrooms will be newly painted, given lots of equipment, computers, Smartboards, resources, support staff and a renewed sense of mission - which is not a bad thing – for those children. But the children in the old school will suffer terribly. Differences will be stark - and all will be painfully aware of it. There will be turf fights and the “old PS 14” will inevitably lose. They will be shortchanged on the use of the gym, library and cafeteria - less learning and further demoralization. The new school will not have test scores for years and will remain off the failing lists. The DOE will send special education children elsewhere. So the number of failing schools will drop citywide and the Mayor will look good. Perhaps the DOE might be trying to build up the nearby charter school or may even be making room for a new charter since building charters is their mission. The staff and children have not failed. The failure falls squarely on the shoulders of the captains of the ship - Bloom,Klein,Black &Walcott for 10 years of mismanagement, incompetency, poor leadership and lack of support. One thing that we can count on is this decision is not being made in the best interest of children. Jan. 25, 2012, 11:20 a.m.
9:28 p.m. | Updated The announcements came year after year. Eight schools to shut down in Manhattan. Ten in the Bronx. Six in Brooklyn. Two in Queens. None on Staten Island. It was hard for Staten Islanders not to develop a degree of superiority when it came to school closings. Since 2002, the year Mayor Michael R. Bloomberg gained control of the system, the city has shut down 117 schools, leaving the borough untouched — until now. But one of them has finally been singled out. Public School 14 Cornelius Vanderbilt in the Stapleton area of Staten Island is among 19 schools the city has marked to be closed, with the final judgment to come on Feb. 9 in a vote by the Panel for Educational Policy. At a raucous hearing at P.S. 14 on Wednesday night, about 400 parents, students and teachers filled the auditorium as an overflow crowd sat in a cafeteria down the hall. About 20 minutes into the meeting, people in the audience began shouting questions about the school’s future at officials for the city’s Education Department and criticizing the plans to close the school. It is no secret that the school, serving more than 660 students in prekindergarten through fifth grade, has been struggling. In recent years, its grade on its progress report card dropped from an A to a C to a D.
P.S. 14 ranked in the bottom 4 percent of elementary schools in the city in mathematics and English language arts proficiency last year. About 31 percent of students met state standards on the math exam, while just 23 percent passed the English exam. Still, none of that is new, leaving the community to wonder, Why now? Two other schools on Staten Island also saw their progress report grades drop from an A to a C to a D in recent years: P.S. 52 John C. Thompson and P.S. 60 Alice Austen. P.S. 54 Charles W. Leng went from a B to a C to a D.
A spokesman for the city’s Education Department said the decision to close P.S. 14 was rooted in performance. The Education Department’s plan would involve phasing out P.S. 14 while opening a new school, Public School 78, in the same building. (In the time that the city has closed 117 schools, it has also opened 535 new ones.) As P.S. 14’s students graduate, P.S. 78 will grow to accept children from the neighborhood. Residents in the area say the plan amounts to much more than a name change. They say it would strip the school of more than 100 years of history and take away generational legacies shared by families in which grandparents, parents and children all attended the same school. Deborah Rose, a city councilwoman who represents Staten Island’s North Shore, which includes Stapleton, said P.S. 14’s neighborhood was poor. The borough’s largest New York City Housing Authority complex is down the block from P.S. 14, and long lines frequently form at a food pantry across the street. Ninety percent of students at P.S. 14 qualify for free or reduced-price lunch, and 19 percent are entitled to special-education services. Harold Williams, a technology teacher at P.S. 14, said many of his students were exposed to drug abuse, alcoholism and crime. Before the staff members can even begin to teach, he said, they have to become secondary parents and earn the students’ trust. In 2009, the school was on the state’s list of persistently dangerous schools, but it came off a year later, aided by a series of staff and student workshops, the presence of an additional security officer and efforts to better the school culture, said Mr. Williams, who is also the teachers’ union representative at the school. New reading and math curriculums have been implemented, despite budget cuts, and math and English test scores have gone up, albeit slightly. Mr. Williams said the staff had been striving for an A or a B in the next progress report. Mr. Thomas, the Education Department spokesman, said the community’s challenges were all the more reason for the city to step in. A former principal at the school, Frank Carpenito, said it had always been difficult to get help from the city. Mr. Carpenito, who worked as a teacher, an assistant principal and a principal at the school for a combined 34 years, said things had only gotten worse since he left. He said citywide changes in district organization had left few school leaders with the kind of close relationship he once had with P.S. 14′s superintendent. Even then, he said, it was common for P.S. 14 to be ranked toward the bottom of Staten Island schools, in large part because of the low-income community. Amy Padnani is a Web producer for The New York Times and SchoolBook contributor. Has UFT Had Enough or Just PEP Power Posturing?